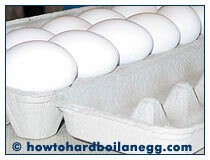 Before you get started, here's some information to help you obtain great results in the recipes calling for your hard-boiled eggs. Tip #1 (for deviled eggs only:) If you are making deviled eggs, you can better center the egg yolks in their shells by resting the eggs on their sides for about 8 hours (or overnight.) When cooked with a centered yolk, the deviled egg whites are sturdier to pick up and handle after you have removed the yolks. One easy way to do this is to simply position the eggs on their sides right in the egg carton. You won't be able to close the lid after placing the eggs this way, so just sit your egg carton on a shelf in the refridgerator with good clearance or extra space, or cut the egg carton lid off. When making deviled eggs, you may wish to cook an extra egg or two as well, because it is common for at least one egg to crack or be very uncooperative during peeling and you'll need the extra egg to complete your recipe. Tip #2: Use older eggs. An egg that is about a week old or older (but of course not past the expiry date) is easier to peel than one that is freshly laid. Why? Two things happen when an egg reaches this age: 1.) The egg becomes more alkaline and 2.) the air pocket at the end of the egg gets bigger as air is absorbed through the porous shell. The combination of these factors magically makes the egg shell easier to remove.